Mozilla plans to release Firefox 60.0.2 later today to the stable channel. The new version of the Firefox web browser is a security and bugfix release, and a recommended update for users of the stable version of the browser. 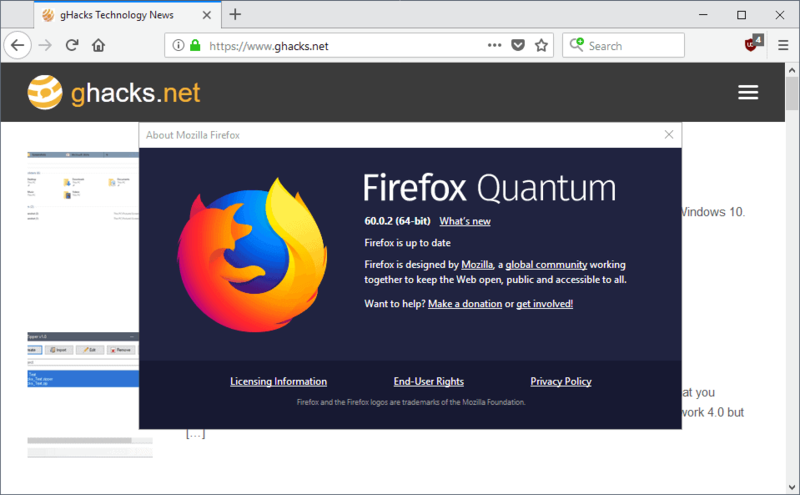 Mozilla released Firefox 60.0 to the stable channel in the beginning of May and published Firefox 60.0.1 at the end of May fixing several bugs in the browser. The next stable version of the Firefox web browser will be released on June 26, 2018 if things go as planned according to the Firefox release schedule. Firefox 60.0.2 is not yet offered on the official Mozilla website or through the web browser's automatic update functionality. It will become available later today if no last minute issues block the release. Fixed various security issues. The security issues are not listed yet as Mozilla releases security related information after it releases updates. In other words: it is unclear how severe the issues are that Mozilla fixed in the release. Fixed missing nodes in the Developer Tools Inspector Panel. If you check the bug, you will notice that Ghacks was the example for the bug (not sure if only site affected but it would be strange if Mozilla would publish an update just for my tiny site but it appears to be a wider issue). Anyway, thanks Mozilla for fixing it! Fixed font rendering on Mac Os X 10.11 and earlier if third-party font managers are used. Updated NSS (Network Security Services) to 3.36.4 from 3.36.1. That's all the fixes the release notes will list when they are published by Mozilla. The Inspector issue seems to be widespread and if you use it, you may want to upgrade to the new version as well. According to Mozilla, it did affect all Firefox channels and not just the stable one. Considering that Firefox 60.0.2 fixes security related issues, you may want to consider upgrading to the new version as soon as the release is published by Mozilla. Whether you do so using the browser's automatic update functionality or by downloading a copy of Firefox from Mozilla is up to you. Now You: do you run Firefox? Mozilla plans to release Firefox 60.0.2 later today to the stable channel. The new version of the Firefox web browser is a security and bugfix release. And even now I have two and a half outher browsers fired up (Google Chrome, Ms-IE11 and the have being MS-Edge.) but I am only using them in the event of an emergency (Being Firefox is not working with a specific site). In all the years that I ran Nighly, I experienced major issues only three or four times (meaning, Nightly would not start or the interface would not work properly). It runs extremely stable. Yesterday I’ve tryed Waterfox and Basilisk with my 67 add-ons. With Basilisk only one add-ons (‘Open with’ missing bar buttons) had issue; on the other hands it still is ‘more or less beta at all times. Waterfox could be a good alternative but I already saw some little conflict with customize browser add-ons like All-In One Sidebar and Status-4-Evar: very bad feelings. Without an add-ons developer community that follow these fork there is no a real future for my point of view. There are some consideration too about security suites (ie Kaspersky) and cleaner program supports: a basic user get used to pre-australis can’t continuously loose its time. I’ll stay with ESR or comeback to 54-55 (which is better in performance?) for a while maybe without security update but with no add-ons issue and and good customization too. I’m really pissed off. I’ve tried Vivaldi and Palemoon too, but both too far from my needs. So I also have now to reinstall Chrome as second browser for bank login or future compatibility issues due to old main browser version. Try Epic Privacy Browser by Alok Bhardwaj. It has an embedded VPN and privacy issues are minimal. It’s not supported by security suite and anti-logger. Now I’m testing if I can use both ESR (or 54.01) and Quantum x64 toghether with two profile and quickly switch to the second using ‘Open With’ with ‘-no-remote profile’ parameter. Sincerely Photon UI is better than Australis (maybe tabs under bookmarks) and I can live without CTR. S-4-E and TFSC with the exception of ‘All-In-One Sidebar’ features. Also Maone wrote that a webextensions version of Flashgot will come soon. But my god, I’ve seen how limited have become webextension add-ons like ‘Tile Tabs’, NoScript, Popup Blocker Ultimate and whatever else. And still missing alternatives for others like iMacros. Simply most users don’t care to it because they don’t use add-ons exept for AdBlock and similar. I agree that Photon is better than Australis, but I find it worse than the pre-Australis UI, so I still consider CTR to be extremely valuable. And it’s not too much to ask for a more compact view, tabs under bookmark, status bar and sidebar especially when you are limited in customization. Same future issue for Basilisk and Waterfox (with Australis) without a developer community to mantain most used and classic add-ons. On the other hand, if majority of users use only few add-ons (adblock, scritps, popup) and there is no much difference in them between Firefox and Chrome due to new constrains, well… We all know browser usage statistics. Control / Shift / Delete brings up a broken ‘Clear Recent History’ window. The window size can not be adjusted, and the ‘Clear Now’ button at the bottom can not be accessed. Firefox is in too big a hurry with their updates, like Windows 10. If you bring the broken ‘Clear Recent History’ window up, check the boxes that you can, and press ‘Enter’, it will clear what it can. Unfortunately, “rapid release’ is the latest fad in the software engineering world, and it’s not just Win 10 and Firefox that are doing it. I think it’s actively harmful and is leading to a reduction in software quality, so I’m hoping this fad will end soon. weird thing. lately (as in last few days) i notice i’ve been getting issues opening links in new tab. it opens a new tab but loads nothing. hitting reload button does nothing, though whacking enter in the url bar works. if you close the tab, you can’t reopen it. mostly noticing it on bbc news site, but that’s probably because i tend to open new tabs more i guess.